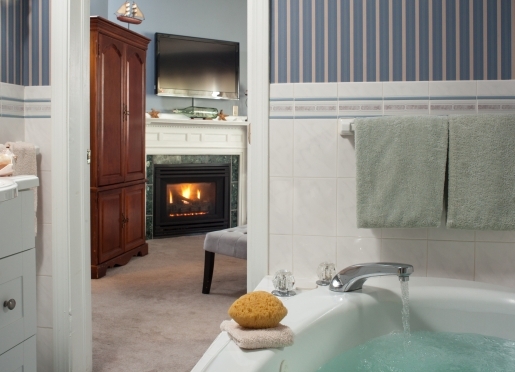 Come enjoy a fabulous fireplace & Jacuzzi!! Mum says "it's a no lunch day"! Framed by two enormous beech trees, the Beech Tree Inn and Cottage B&B in Newport Rhode Island are charming Victorian homes that offer spacious guest rooms. Perfectly located accommodations in quiet "Historic Hill", it's just a short walk to Newport's fabulous restaurants, boutique shopping, ocean beach, and famous history. Lovingly renovated, you are welcomed in a comfortable living room with fireplace and then afforded the added convenience of a common area complete with an equipped kitchen, refrigerator, and ice machine. Many rooms feature a fireplace and Jacuzzi tub for extra luxury. The garden and rooftop decks allow you to soak up the sun, daydream quietly, or chat with a bottle of wine. 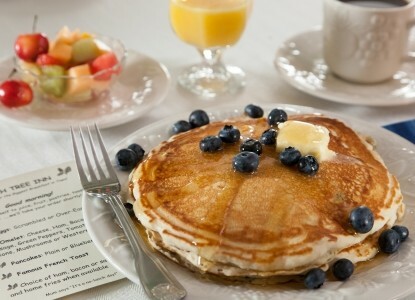 "Famous for our warmth & hospitality" you will wake to a scrumptious full breakfast. 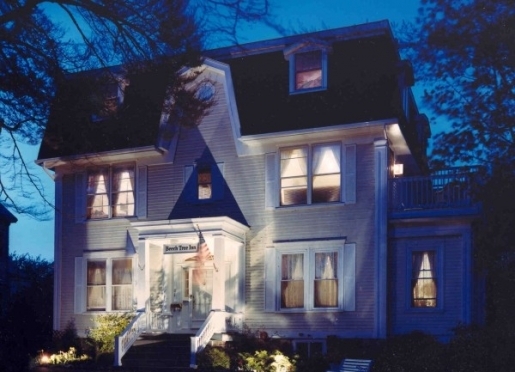 Comfortable and casual, we invite you to discover the relaxed ambiance of The Beech Tree Inn Bed and Breakfast in Newport, RI. The Beech Tree Inn is perfect for quiet getaways, honeymoons, Naval War College breakfast seminars, celebrating birthdays, anniversaries, weddings, extended stays, small groups, reunions, family events, and business travel. Travelers are always looking for memorable and relaxing experiences. Let’s discover more through the words of our innkeepers. Many thanks to Shelley Mahood for sharing her own secrets with BBOnline.com! Good price, good food, good rooms! We’re known for the biggest breakfast in town (Frommers), but I love our rooms the best. They are spacious, clean, and contemporary. Newport has a ton of things to do with lots of history, the beach, yachting, restaurants, shopping. It is definitely a destination. I can’t say there is a #1 reason people visit since we have guests coming for everything from bird-watching (we have 2 bird nature areas and are on a migratory trail) to military (Newport Naval Station & Navy War College) to Tennis Hall of Fame to guilded-age mansions. The book in our front lobby is FULL of great compliments. We’re happy when guests say they feel at home, have a good night’s sleep, and enjoy breakfast. Probably the best compliment is that we have a bunch of return guests. We have one couple that have stayed with us every year for their anniversary for a decade. Newport’s best kept secret is how integral it has been to our country’s overall history. Tammy & Sam from Newport Tour & Guide Company give private tours of the area and I have learned so much. People would be amazed at how central Newport has been. I just learned yesterday that the sailor kissing the woman in NYC upon hearing the news of the end of WWII is from Newport and lives here today. Four nights is not enough to take-in all that Newport offers. I’m still learning & doing new things after all these years. Go to Breaker’s mansion (built by Vanderbilts), walk on the Cliff Walk, go to Sachuest beach (aka second beach) for surfing, take a walking tour from Newport Historical Society and Newport Tour & Guide Company, sail in Narragansett Harbor, shop at antique & trinket shops, go to Newport Art Museum or Tennis Hall of Fame or Redwood Library or Touro Synagogue, and eat at many great restaurants. Newport is not very big and is a walking town. Walk to some wonderful restaurants on Broadway in 5 minutes. Walk to the beach or to the harbor in 10 minutes. Too many great restaurants. Our two favorites are Fluke Wine Bar & Kitchen for fresh & local dishes, and Fifth Element for interesting, unique & yummy food. The Best clam chowder would be at the Coddington Brewery and Black Pearl. When it comes to yummy Italian food, Mamma Luisa, Pasta Beach, and Nikolas Pizza are our top choices. We just love Newport and don't mind sharing some of our favorite things - you may notice it's mostly FOOD! Everybody asks for a recommendation so be sure to give us your feedback. China Star III – 110 William St, 841-5556, www.chinastariii.com – Crab Rangoon a must! Historical Society – 127 Thames, 841-8770, www.newporthistorical.org – GREAT walking tours! Drive – Follow Ocean Drive. Check out Eisenhower's Summer House (www.eisenhowerhouse.com) at Ft Adams (www.fortadams.org). Feed carrots to animals at the old Hammersmith Farm (Jackie Kennedy's home). Visit the lighthouse at Castle Hill. Enjoy the kite sailing at Brenton Point State Park (www.riparks.com/brenton.htm). See mansions along Bellevue. Favorite Running Route: Best in early morning; left to Memorial, left and across to the Cliff Walk then South to Narragansett, right to Bellevue, right to Kay, right to Rhode Island Ave.
Take the first exit off the Newport Bridge called "Scenic Newport" & turn right.